PanARMENIAN.Net - Scientists have been working on using robotics to carry out complex eye surgery for years, and now the first operation has been performed - and it was a success! As Digital Spy reports citing BBC News, a team at the John Radcliffe hospital in Oxford used a robotic device to a membrane one hundredth of a millimetre thick. The patient, a 70 year old Reverend called Bill Beaver, called the operation, "almost the world of fairy tales but it's true. "I'm just fortunate that I'm the first to have it." Robotics have been used to assist operations for many years now, but this is the first time robots have gone inside the eye. A Professor from the University of Oxford, Robert MacLaren, told the BBC: "Operating at the back of the eye needs great precision, and the challenge has been to get a robot system to do that through a tiny hole in the wall of the eye without causing damage as it moves around." "Most robots in theatre are big, with big engineering, whereas this is tiny - everything had to be shrunk down," he continued. MacLaren, who led the first-of-its-kind surgery, explained the advantage of robotic eye surgery: "Normally when we do this operation by hand we touch the retina and there is some haemorrhage, but when we used the robot the membrane was lifted cleanly away." 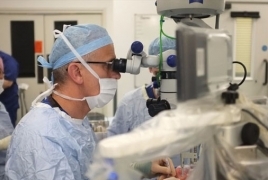 And he has high hopes for the future, stating: "There is no doubt in my mind that we have just witnessed a vision of eye surgery in the future. "We can certainly improve on current operations, but I hope the robot will allow us to do new more complex and delicate operations that are impossible with the human hand." Digital Spy. Robotic eye surgery is now a thing - and it works!